A typical trick. South has led the Jack of Diamonds and no-one else has been able to "follow suit". Who has won this trick depends on the game being played. A trick-taking game is a card game or tile-based game in which play of a "hand" centers on a series of finite rounds or units of play, called tricks, which are each evaluated to determine a winner or "taker" of that trick. The object of such games then may be closely tied to the number of tricks taken, as in plain-trick games such as Whist, Contract Bridge, Spades, Napoleon, Euchre, Rowboat, and Spoil Five, or on the value of the cards contained in taken tricks, as in point-trick games such as Pinochle, the Tarot family, Rook, All Fours, Manille, Briscola, and most "evasion" games like Hearts. The domino game Texas 42 is an example of a trick-taking game that is not a card game. Trick-and-draw games are trick-taking games in which the players can fill up their hands after each trick. Typically, players are free to play any card into a trick in the first phase of the game, but must follow suit as soon as the score is depleted. Certain actions in trick-taking games with three or more players always proceed in the same direction. In games originating in North and West Europe including England, Russia, and the United States and Canada, the rotation is typically clockwise, i.e. play proceeds to the left; in South and East Europe and Asia it is typically counterclockwise, so that play proceeds to the right. When games move from one region to another, they tend to initially preserve their original sense of rotation, but a region with a dominant sense of rotation may adapt a migrated game to its own sensibilities. For two-player games the order of play is moot as either direction would result in exactly the same turn order. The player sitting one seat after the declarer (one with the highest bid and not the dealer) in normal rotation is known as the eldest hand. The eldest hand leads to the first trick, i.e. places the first card of the trick face up in the middle of all players. The other players each follow with a single card, in the direction of play. When every player has played a card to the trick, the trick is evaluated to determine the winner, who takes the cards, places them face down on a pile, and leads to the next trick. The winner or taker of a trick is usually the player who played the highest-value card of the suit that was led, unless the game uses one or more trump cards (see below). The player who leads to a trick is usually allowed to play an arbitrary card from their hand. Some games have restrictions on the first card played in the hand, or may disallow leading a card of a particular suit until that suit has been played "off-suit" in a prior trick (called "breaking" the suit, usually seen in cases of a trump or penalty suit). Other games have special restrictions on the card that must be led to the first trick; usually this is a specific card (e.g. 2♣) and the holder of that card is the eldest hand instead of the person one seat after the dealer. The following players must follow suit if they can, i.e. they must play a card of the same suit if possible. A player who cannot follow suit may sluff a card, i.e. play a card of a different suit. A trick is won by the player who has played the highest-ranked card of the suit led, i.e. of the suit of the first card in the trick (unless the game uses a trump suit; see below). It can be an advantage to lead to a trick, because the player who leads controls the suit that is led and which others must follow; playing a suit that the leading player has many of decreases the chance that anyone else would be able to follow suit, while conversely playing a suit the player has few of allows the player to rid their hand of that suit (known as voiding the suit), freeing them from the restriction to follow suit when that suit is led by another player. On the other hand, it can also be an advantage to be the last player who plays to the trick, because at that point one has full information about the other cards played to the trick; the last player to a trick can play a card just slightly higher or lower than the current winning card, guaranteeing they will win or lose it by the minimum amount necessary, saving more valuable high or low value cards for situations where they must guarantee that a card played early to a trick will win or lose. In most games with trumps, one of the four suits is identified as the trump suit. In the simplest case, there is a static trump suit such as the Spade suit in the game Spades, or a dedicated symbol-less trump suit in the Tarot family. More often, a dynamic trump suit is determined by some means, either randomly by selection of a card, or decided by the winner or winning bid of an auction. In certain games, such as Rowboat and Rage, the trump suit may change during the course of the hand, even from trick to trick. In most modern games with trump suits, the rules for following suit do not distinguish between the trump suit and the plain suits. If a trick begins with a plain suit card and a later player cannot follow suit, the player may choose freely to either sluff (discard a card of another plain suit), or ruff (trump the trick by playing a trump card). Subsequent players to the trick must still follow the original suit, and may only discard or trump if they do not hold a card of the suit led. Certain games are "play to beat" or "must-trump"; if a player cannot follow suit but can play trump, they must play trump, and additionally if they are able they must beat any trump card already played to the trick. Pinochle and several of the Tarot card game variants have this rule. In some games, in addition to or separately from a trump suit, certain fixed cards are always the highest trumps, e.g. the Jacks in Skat, the Jacks or Jokers in Euchre, the Rook Bird card in Rook, or the Fool in certain Tarot games. If a player who can follow suit does not do so, or in games with additional restrictions on card play, not following these restrictions is known as a revoke, or 'renege'. A revoke typically cannot be discovered at the time when it is committed, but when a player plays off-suit to a trick, competent opponents will make a mental note that the player does not hold the suit led, and will notice later if the player later plays a card of the suit they were thought to be void in. The situation is similar for other types of revoke. Most game rules prescribe a severe penalty for a revoke and may also result in the hand being voided (a "misdeal"). Decks of cards have been marketed for trick-taking games with the traditional Anglo-French suit symbols, but in four colors; these are often called "no-revoke" decks, as the color contrast between each suit makes a potential revoking play easier to spot and harder to do accidentally. When all tricks have been played, the winner of the deal and the players' scores can be determined. The determining factor in plain-trick games (the most popular form of trick-taking games in English-speaking countries) is simply how many tricks each player or partnership has taken. In point-trick games, certain card values are worth varying points, and the players sum the points from cards in their "scoring piles" that were accumulated by taking tricks. Points for cards, and the method of counting points, vary by game; in Rook, for example, the 5-card of each color is worth 5 points, the 10 and 14 (or Ace) is worth 10, and the Rook Bird (or Joker) is worth 20, while all other cards are worth nothing. Pinochle has many popular scoring variants usually based on point values for face cards and Aces, while pip cards score no points. In French Tarot, all cards have a value including a half-point, and are traditionally scored in pairs of a high-value and a low-value card which results in a whole-point value for the pair. In the most common positive or race games, players seek to win as many tricks or card points as possible. To win a deal, a player typically needs to win a minimal number of tricks or card points; this minimal threshold is usually called the "contract", and may be defined by the game's rules (a simple majority of total available points or tricks, or tiered thresholds depending on which player or side has captured certain cards), or the result of an "auction" or "bidding" process. A player who wins more than the number of tricks or card points necessary for winning the deal may be rewarded with a higher score, or conversely (in exact-prediction games) they may be penalized. Other criteria also occur. Sometimes the last trick has special significance. In marriage games such as Pinochle the winner of the last trick receives 10 points in addition to the card points, while in final-trick games such as Cắt Tê only the winner of the last trick can win a deal. There are also blends between positive and negative games, e.g. the aim may be to win a certain prescribed number of tricks. Many card games, regardless of their normal scoring mechanism, give bonuses to players or partnerships who win all tricks or possible points in a hand, or conversely lose all tricks or points. In auction games, bidding players are competing against each other for the right to attempt to make the contract. In a few games, the contract is fixed (normally a simple majority, less often based on certain cards captured during play) and players' bids are a wager of game points to be won or lost. In others, the bid is a number of tricks or card points the bidder is confident that they or their partnership will take. Either of these can also include the suit to be used as trumps during the hand. The highest bid becomes the contract and the highest bidder is the contractor, known in some games as the declarer or taker, who then plays either with or without a partner. The other players become opponents, whose main goal is to prevent the contract being met. Popular examples include Contract bridge, Pinochle, tarot games, Skat, Belote and Twenty-Eight. In many auction games the eldest hand leads to the first trick, regardless of who won the auction, but in some, such as Contract Bridge, the first lead is made by the player next in rotation after the contractor, so that the contractor plays last to that trick. In some games not all cards are distributed to the players, and a stock remains. This stock can be referred to by different names, depending on the game; supply, talon, nest, kitty, and dog are common game-specific and/or regional names. In some games the stock remains untouched throughout play of the hand; it is simply a pile of "extra" cards that will never be played and whose values are unknown, which will reduce the effectiveness of "counting cards" (a common strategy of keeping track of the cards that have been played or are yet to be played). In other games, the winner of an auction-bidding process (the taker or declarer) may get to exchange cards from his hand with the stock, either by integrating the stock into his hand and then discarding equal cards as in Skat, Rook and French Tarot, or in a "blind" fashion by discarding and drawing as in Ombre. The stock, either in its original or discarded form, may additionally form part of one or more players' "scoring piles" of tricks taken; it may be kept by the declarer, may be won by the player of the first trick, or may go to an opposing player or partnership. In some games, especially two-player games, after each trick every player draws a new card. This continues while the stock lasts. Since this drawing mechanism would normally make it difficult or impossible to detect a revoke (for instance, the player may not be able to follow suit, so they play off-suit and then immediately draw a card of the suit led), in the first phase of trick-play (before the stock is empty) players generally need not follow suit. A widespread game of this type is Schnapsen/66/Marriage. In many games such as Hearts and Oh Hell, all players play individually against each other, but in other games there are fixed or varying partnerships. In some games the partnerships are decided by accident; in some Schafkopf variants two players holding the black Queens are partners for that hand. Such games need special rules in case a single player holds both black Queens. Five-player French Tarot is similar but allows the taker to call out a suit for which he does not possess the King of that suit, and is partnered with whomever does have it against the other three. In some games the contractor forms a partnership with the winner of the first trick, or with the player who holds a certain card. There are trick-taking games played with Domino tiles instead of playing cards. These include the Chinese Tien Gow and Texas 42. Many games are played with one or more stripped decks (a deck from which certain card values are removed). The most common stripped deck is a piquet deck, used for piquet, Belote, Skat, Euchre, Bezique and (with two piquet decks) Pinochle, among others. Rook's main variant, Kentucky Discard, uses the equivalent of a 52-card deck with all card values 2-4 removed. Most regional Tarot variants, especially Central European and Italian variants like Tarock and Tarocco, use some subset of the "full" 78-card Tarot deck. The earliest card games were trick-taking games (as evidenced by the rank-and-suit structure) originating from China and spreading westwards during the early part of the second millennium. Michael Dummett noted that these games share various features. They were played without trumps, following suit was not required but only the highest card of the suit led wins, rotation was counter-clockwise, they were plain-trick games, and that the pip cards of one or more suit are in reverse order so that the lower cards beat the higher ones. Two revolutions occurred in European trick-taking games that would lead to the development of ever more sophisticated card games. The first is the invention of trumps (and following suit to contain their power) in the 15th-century. The second was bidding in the 17th-century. According to card game researcher David Parlett, the oldest known European trick-taking game, Karnöffel, was mentioned in 1426 in the Bavarian town Nördlingen - roughly half a century after the introduction of playing cards to Europe, which were first mentioned in Spain in 1371. The oldest known "trumps" appear in Karnöffel, where specific ranks of one suit were named Karnöffel, Devil, Pope etc. and subject to an elaborate system of trumping powers. Around 1440 in Italy special cards called trionfi were introduced with a similar function. These special cards are now known as tarots, and a deck augmented by tarots as a tarot deck. The trionfi/tarots formed essentially a fifth suit without the ordinary ranks but consisting of trumps in a fixed hierarchy. But one can get a similar effect by declaring all cards of a fixed or randomly determined suit to be trumps. This method, originating with Triomphe, is still followed by a number of modern trick-taking games that do not involve an auction. Parlett notes that while trumps were retroactively added to some games, such as Trappola, no example is known of trumps being removed from a game. The invention of trumps became so popular that very few European trick-taking games exist without them. This did not stop Piquet from becoming the most popular card game in Europe during the 16th-century. The invention of bidding for a trump suit is credited to Ombre, the most popular card game of the 17th-century. Rather than having a randomly selected trump suit, players can now hold an auction for it. The most popular games of the 18th-century was tarot which experience a great revival. During this time, many tarot games borrowed bidding over the stock (taroc-l'hombre). During the 19th-century, tarot was driven to terminal decline in many countries by Whist. In the 20th-century, Whist (now with bidding) developed into Contract bridge, the last global trick-taking game. It is possible that the origin of the practice of counting tricks (in plain-trick games) was the counting of cards won in tricks. It was therefore a logical development to accord some cards a higher counting-value, and some cards no value at all, leading to point-trick games. Point-trick games are at least as old as tarot decks and may even predate the invention of trumps. All point-trick games are played with tarot decks or stripped decks, which in many countries became standard before 1600, and neither point-trick games nor stripped decks have a tradition in England. 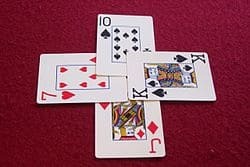 While there is a number of games with unusual card-point values, such as Trappola and All Fours, most point-trick games are in the huge family of Ace-Ten card games beginning with Brusquembille. Pinochle is a representative of this family that is popular in the United States. Other examples include Belote and Skat.